Ever since I can remember, I have always been drawn to Microsoft Technologies, whilst working in corporate and academic training environments for more than 25 years – it all started at UCT, many moons ago, and two of my biggest dreams were to visit THE Microsoft building, or to work for Microsoft. Thank you, Microsoft, for making one of my dreams come true during 2015! 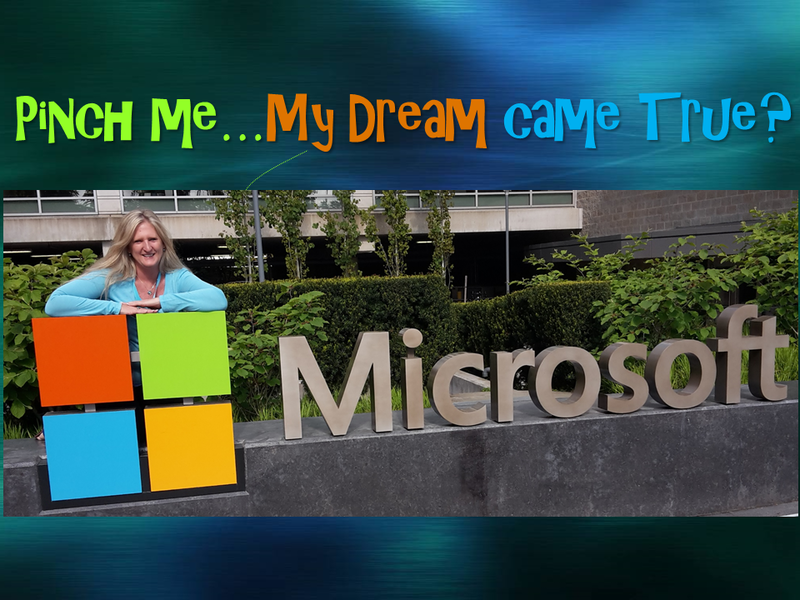 The opportunity to be physically present @ Microsoft Redmond, Building 92, was awesome! There were 249 MIEExperts attending the Redmond Global Forum from around the globe, I am extremely privileged to be one of them! After travelling to Redmond, we had the opportunity to write the MCE exam the following morning. I will write an additional post about this stunning certification, but we were thrilled to have passed the exam, which was a great start to the Global Forum E2 visit. This was a fantastic opportunity to showcase our learning activities and collaboration at its best! We were grouped according to technologies used,which was great as we could interact with each other as to how we have created the learning experience for education. The atmosphere was buzzing with MIEExperts from all over the world setting up at round tables. The session was arranged so that each MIE had an opportunity to walk around and get to know one another and explain their activity. At this session I was pleased to have met Aaron Maurer, who’s activity really engaged me – he encouraged one to interact practically with his learning activity. You will see a pic of him [in the bowtie] on the TeachMeet slideshow, below as well as a pic of my toothbrush motor I created at his table. The other highlight for me was a discussion with Mike Tholfsen [Programme Manager, OneNote] who introduced me to the OneNote Engineer – Scott who listened to me discuss how I would enhance OneNote for Teachers. Before leaving for Redmond, the MIEExperts chose from a list of Educator Led Sessions to attend at the Global Forum. I attended the session on Office 365, run by SA MIEExpert, Warren Sparrow and Mette Hauch. Warren really did SA proud! We were taken on a journey through the features of O365. I also attended the session on the use of Minecraft in the Classroom, which was a panel driven conversation – very interesting to hear from those who just started using Minecraft in the classroom and those who have been using it for some time. The last session I chose was OneNote [of course, I chose that session as I love OneNote 🙂 – always more to consume]. Joshua Sawyer and Kevin Sait [Head of IT Strategy for Wymondham High Academy Trust in the UK] were absolutely outstanding – learnt so much from their experiences with OneNote and also how Kevin implemented Wymondham High O Team, a group of students who have been instrumental in developing the use of Office 365, OneNote and mobile devices at his school. Angela Schaerer and Warren Sparrow presented on 21C Learning Design, a great session with an interactive task! 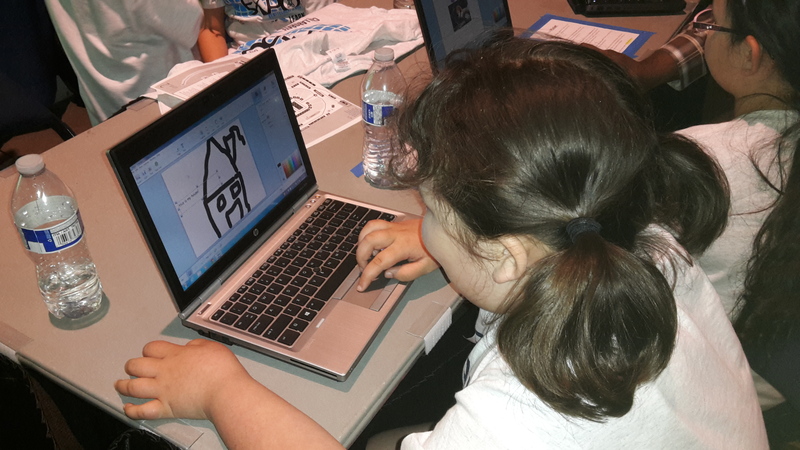 THIS WAS AN AMAZING OUTING – I thoroughly enjoyed the visit to the 2015 Technology Expo – a venue FULL of little children who are using technology extensively in the classroom. I was blown away by the confidence and knowledge of these little beings. Such an inspiration! A few really stood out for me, so I will share these but there is so many more experiences I had during this expo. These two boys demonstrated how they use OneNote at school. They engaged in adult conversation with me and had an answer for any question I asked. I had such a cool chat to them and we shared how we would enhance the programme for teachers. This little girl explained all the icons in order to draw – after she explained so confidently, she made me sit down and go through all the icons myself to draw a picture. She kept coming back to help me when I was stuck and explained how I needed to use the tools – BRILLIANT! There were so many more moments at the tech expo, but think you have the idea. THEN, THE BEST FOR LAST…. The Global Educator challenge is where MIE Experts ‘walk the talk’ showing the impact of technology on students readiness, classrooms, educators and communities worldwide. MIE Experts are divided into groups with peers from different parts of the world to design a project around the use of Microsoft technologies within the specific theme of Bravery, Courage, and Leadership. I thoroughly enjoyed the interaction with all these wonderful MIEExperts – we really did a good job getting to know each other – collaboration and continued interaction is the key to forums such as this. We are all staying in contact and have the advantage of seeing each others work being part of the Facebook group for MIEExperts. I MATTER (I AM ENOUGH)! Note to self to remember everyday for 30 days for 30 seconds a day, to build the habit. I MATTER ‪#‎MSFTEduE2‬ My superpower is…. Here are a few of my best moments from E2 – the most beneficial for me was the contacts and collaborative opportunities I achieved through being an MIE before, during and after the E2 Global Forum. I encourage every teacher to submit their learning activity for 2016 and that you sign up for the Educator Network on http://www.educatornetwork.com for amazing free tools, learning activities, tutorials, projects and earn badges for free professional development courses. 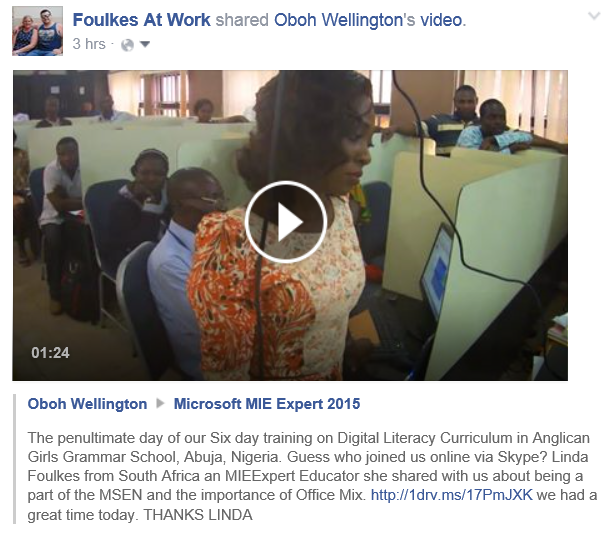 Thank you to Wellington Oboh for inviting me as a presenter to share the Microsoft Educator Network and Office Mix. It was great to see all the smiling, happy faces throughout the Skype session. I shared my screen in order to present on MSEN, then used the same presentation as an OfficeMix example explaining how one would add Office Mix via the mix.office.com website directly into PowerPoint, the features of Mix as well as a few design considerations. Being chosen as an Microsoft Innovative Expert Educator for 2015 has provided me with the most amazing “learning” MOMENTS to date. Support and involvement from Microsoft South Africa and Globally has been absolutely phenomenal. Did you know that Microsoft provides such “directed learning” pathways for teachers, students and individuals to professionally develop themselves? It is extremely important for teachers to engage in their own PD in order to engage students. Every single day I am learning new technologies, new updates, gaining new collaborations and so on. Often I start to put my technology away, after being stared at over the top of my laptop by my beautiful jack russell [Laila] who reminds me that it is time to play ball, and “plup” goes my Facebook page with just another burst of learning…so one really needs to be strong and “park” it for a little later…the reason for this comment is that one needs to keep the balance between work and family to remain healthy, happy and productive! I am so thankful [and beyond excited] to Microsoft for affording me the opportunity to attend the Redmond Global Forum at the end of April – counting the days till I am able to meet some of the most inspiring teachers in the World, be an agent of change on my return to South Africa, and source opportunities to continue my learning pathway with the newly found knowledge which Redmond instills in me. The above Mix is a walk-thorough of the features of the Microsoft Educator Network using OfficeMix as the delivery tool. Click the image to view the mix. This presentation was created as a resource [using OfficeMix] for a Skype call with teachers from Nigeria to share with them the benefits of the MSEN. One can spend a lot of time browsing the net and not really “finding anything of value” if you do not know where to look or do not have a PLN or support. This is when most give up…unless they have knowledge about the MSEN. The benefits of the MSEN website are explained in the mix above. Besides all the benefits listed, my most favourite things about the Educator Network are that everything is under one roof, is 100% free, and the opportunity for collaboration with others is immense. Not to mention that one can do PD in the comfort of one’s own home, with a group of teachers or in a training session at school AND IN YOUR OWN TIME! 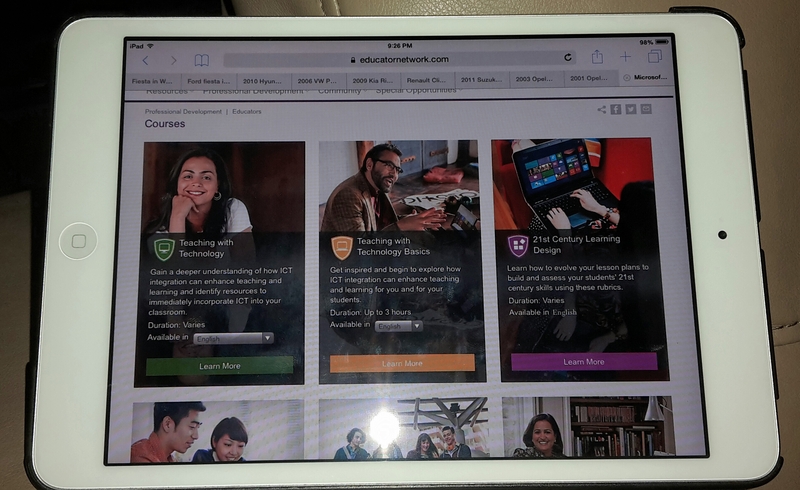 To all the teachers out there who have the Educator Network as their personal learning network for professional development, support or the ability to locate applicable educational resources, I challenge you to inspire TWO teachers by helping them access such a beneficial resource as the Microsoft Educator Network. So spread the news…look no further than the MSEN for the latest technological trends in education. Well it certainly has been a very busy time in “my world ” the past few months! Hence the lack of posting to my blog due to organising a wedding, starting a new position, and just getting involved in helping others through social media. 2015 has started off with very positive interactions and I am most certainly looking forward to getting involved, and challenging myself this year! During the presentation I shared a link to my Office Mix with which I created a walk through of the Microsoft Educator Network. Teachers who have not yet taken advantage of this fantastic resource, should sign up right now – click here to open the site and get cracking on your own Professional Development for Free. CALL FOR COLLABORATION – THE ANGLICAN GRAMMAR SCHOOL FOR GIRLS IN ABUJA, NIGERIA WOULD LIKE TO COLLABORATE WITH OTHER ANGLICAN GIRLS SCHOOLS IN CAPE TOWN – PLEASE CONTACT ME IF YOU ARE KEEN TO GET YOUR SCHOOL INVOLVED.